Toddler has finally started sleeping in - YAY - but like they say, be careful what you wish for! An extremely early riser for the first couple of years of his life, when pre-school started, my 3.5 year old decided that even 8 am was too early to start the day. Most mornings then, we are struggling to wake up, eat breakfast and make it out the door on time. Sound familiar? Enter three make-ahead breakfast recipes that have transformed our mornings from stressful and hurried to relaxed, nutritious and delicious. Overnight oats are simply what the moniker implies - oats soaked in a liquid of choice overnight until they are softened into a pudding-like consistency, presenting themselves as the perfect canvas for additions and toppings like fruits, nuts, sweeteners and spices! The most fun aspect of this dish is getting your kid to make breakfast with you the night before. Talk about serious skin in the game. Oats contain a special kind of fibre called beta-glucan which has been shown to lower cholesterol, prevent heart disease, boost immune function, stabilise blood sugar and even prevent breast cancer. Cinnamon has myriad health benefits including anti-diabetes, anti-microbial, anti-inflammatory, cardio-protective, cognition-boosting, cancer-prevention and female hormone-balancing effects. Raisins are every kid's favourite and chockfull of fibre, potassium, iron, B vitamins and anti-oxidants. With calcium, vitamin D and magnesium from milk, this breakfast is a yummy nutrient powerhouse your kids and you can enjoy for an energetic and delicious start to your day. Mix all the ingredients except the raspberries together and partition into 3 glass jars. Cover and store overnight in the fridge. Top with fresh raspberries or any fruit of choice and slivered nuts right before eating for a delicious and nutritious yet speedy breakfast. Baking with vegetables is a genius idea for three wonderful reasons - added nutrition, natural sweetness and moisture. Carrots, in particular, are the perfect addition to cakes, muffins and breads. 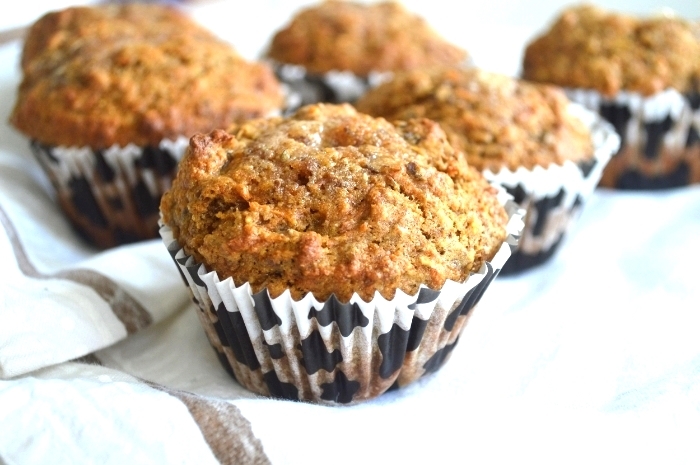 I created these whole grain, omega-3 fatty acid-rich, refined sugar-free, spiced carrot muffins to make my mornings less stressful, more nutritious and delicious. Carrots are brimming with vitamin A, which is ultra important for good vision and critical for developing kids. Carrots contain fibre which helps with regularity and feeds the beneficial bacteria in our digestive tract. They also contain phytonutrients that prevent cancer and free radical damage to our DNA during normal metabolism. Whole wheat instead of regular processed flour is nutrient and fibre rich, helping with satiety and blood sugar control. Flax seeds are an amazing vegetarian source of omega-3 fatty acids which are important for brain development and the prevention of unnecessary inflammation making these nutrient-rich yummy muffins a treat you can feel really great about giving your kids and families. In a mixing bowl, combine the flour, flax meal, baking soda, cinnamon, cardamom and salt. In a separate bowl, whisk the eggs. Add in the vanilla, melted and cooled butter, milk and maple syrup and mix well. Add the carrots and raisins to the dry ingredients. Then add in the wet ingredients and mix until a batter forms without over-mixing. Allow the mixture to rest for a minute or two. Using an ice-cream scooper, transfer the muffin mixture into the paper liners two thirds of the way to the top. Create a small dent and add 1/4-1/2 teaspoon maple syrup in the centre of each muffin. Bake in the preheated oven for 15 minutes or until a toothpick inserted into the muffin emerges dry. Transfer onto a cooling rack. Once cooled, enjoy dipped in milk or with a hot cup of spiced chat for the perfect breakfast or mid-afternoon energy boosting, nutritious snack. I must admit I've usually bought granola, thinking it's too complicated to make on my own, but boy was I wrong! Homemade granola is so easy to make and so much more nutritious and delicious when you play around with your add ins yourself. Not to mention the irresistible aroma that floods your kitchen when its baking. It also makes for the most thoughtful gift for a friend and is ideal for travel. I am sure this will become a breakfast and snack staple in your household too. In addition to the nutrition benefits of oats mentioned above, the nuts in this recipe are rich in protein, fibre, good quality fats, minerals like calcium and magnesium and vitamins E and B. Cranberries and raisins provide anti-oxidants and vitamins, coconut oil can prevent unwanted inflammation and the gentle sweetness of maple syrup is energising without setting off that dreaded sugar rush. Preheat the oven to 350 F / 175 F.
In a mixing bowl, combine all the ingredients except the cranberries and raisins. Mix well. Spread the mixture onto a baking sheet into a thin layer. Bake in the oven for 25 minutes, stirring every 10 minutes. Remove from the oven and transfer into a fresh bowl. Add the dried cranberries and raisins and allow the mixture to cool. Store in an airtight container for 2 months. Enjoy over yoghurt, layered in a yoghurt and fruit parfait, with your milk of choice or on its own as a crunchy, toast, sweet, slightly salty and spiced nutritious and delicious breakfast or snack.